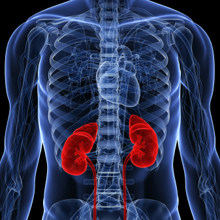 With kidney and liver transplant patients in mind, Emory and Georgia Tech researchers are exploring non-invasive imaging for the detection of immune rejection. With "immunoPET," they can see particular types of immune cells infiltrating a transplanted organ. The National Institute of Allergy and Infectious Diseases has awarded Emory and Georgia Tech investigators a $2.4 million, five-year grant to study non-invasive imaging to detect immune rejection of transplanted organs. When transplant recipients see their doctors, they undergo tests to check whether their immune system is damaging their new organs. These are usually blood tests that check for kidney or liver function, at least to begin with. But to diagnose immune rejection, a biopsy is required. Andrew Adams, MD, PhD, assistant professor of surgery at Emory University School of Medicine, and Phil Santangelo, PhD, associate professor in the Wallace H. Coulter Department of Biomedical Engineering at Georgia Tech and Emory, are proposing to use PET (positron emission tomography) instead. PET is already used to diagnose heart disease and monitor cancer. Using a variant called "immunoPET," the researchers can see particular types of immune cells infiltrating the transplanted organ. The grant is for work with mice and non-human primates, but Adams envisions benefits for transplant medicine: earlier detection of rejection and reduction of risk associated with biopsies. "Patients often require multiple biopsies to assess response to treatment, thus putting them at risk of complications each time they undergo a separate procedure," Adams says. "In addition, a biopsy only samples a small part of the transplanted organ." Santangelo, in collaboration with Tab Ansari, PhD at Emory, Francois Villinger, DVM/PhD at the Univerity of Louisiana at Lafayette and researchers from the NIH, has used a similar approach to study the persistence of SIV infection in non-human primates, which could guide efforts to suppress HIV infection for long periods without antiretroviral drugs. The research also builds upon work by Adams on improved post-transplant drug regimens. "ImmunoPET clearly has the potential to characterize immune cell dynamics in the face of allograft rejection. This work could also open the door to the use of PET in fields such as cancer immunotherapy," Santangelo says.